Addiction to intoxicants is one of the most common problems that has been found over societies and times. Due to the legal restrictions that are imposed on people of a specific society, it is very easy to spot the favorite drug of the people of that place and time. 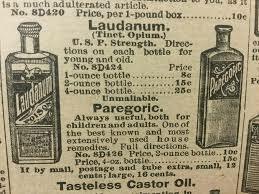 In the case of Victorian England, Laudanum was the most common drug that people were using. The people of England during the 19th century were experimenting with a number of substances for the purpose of intoxication and hallucination as an after effect. Alcohol and opium were the most common, but people were known to consume cannabis and coca. Sometime in the middle of the century, the hypodermic needle was invented and people started to take heroin and morphine as well. Alcohol and tobacco were legal in Victorian times and these cultural developments had started to give people a taste of the effects that hallucinating agents can cause. People started to develop a liking for this and dedicated their time to experimenting and abusing with drugs, linking them to enlightenment. Laudanum became the drugs of the common and the intellectual alike as these were easily available on pharmacies in a number of versions- pills with varnishes and coatings of silver and gold, oils, alcoholic drinks, and syrups and pastes. And if none of these are good, people asked for specific combinations that pharmacists were able to develop from the various raw materials. 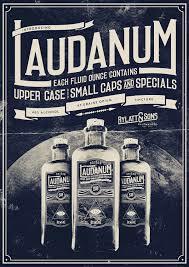 Laudanum is a combination of some of the most popular forms of opium like codeine and morphine. It was developed by Paracelsus in the 16th century. By Victorian times, the procedure of developing was much simplified and cheaper. The Laudanum that became popular in these times contained almost 10 percent opium and was used extensively for medical as well as recreational purposes. 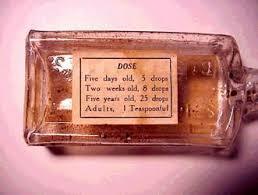 What was laudanum poison used for? 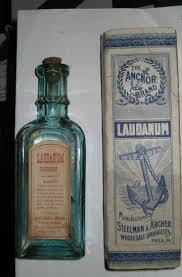 Due to the simple process of manufacturing, it was easy to produce laudanum during Victorian times. Besides, medical science was highly limited in its approach at that time. As a result, it was very common for doctors to prescribe laudanum to their patients and it was done for a very wide range of problems like curing colds and coughs, increasing muscle power and hunger and also to get rid of sickness and pain. Slowly and gradually, people started to consume laudanum on a very large scale. However, opium is a very highly addictive substance, a piece of information that was not common knowledge at that time. Due to these factors, it became very common for people to develop an addiction to laudanum and consume it on a regular basis. Due to its wide availability and usage, it was very common for poets and writers to use references from the same in their works. Many famous works from that time include direct and indirect references to laudanum and opium intake for recreation. There are certain others that have been completely dedicated to describing the ‘amazing’ effects of opium use. The Confessions of an English Opium Eater is one of the most popular works of that time. The writer Thomas De Quincey has discussed the positive as well as negative effects of opium abuse in this work that was first published in 1821 in London Magazine. He has discussed about his personal experiences of developing and fighting an opium addiction in the work that received mixed reviews in 1821. Samuel Taylor Coleridge, one of the poets that are synonymous with Victorian era poetry has Kubla Khan credited as one of his most important works. The poem has been written by him after having a dream. Coleridge has mentioned that the dream he had was at a time when he was sleeping after being heavily under the influence of opium. Arthur Conan Doyle created the character of Sherlock Holmes during this time, which continues to be one of the greatest detective figures of literature even today. In his works, it is seen that Sherlock Holmes himself is a user of drugs and is able to solve the crime much easily after shooting cocaine or heroin. He seeks thrill in life and taking opium brings him closer to a mental stimulation, bringing him out of the dull monotony of routine life. Besides these, many other minor characters in the works of some of the celebrated writers of the times have been seen t have an addiction to opium. Even though laudanum is not referred to directly in any of these works, it was undeniably the most popular drugs at the time. Charlotte Bronte, Robert Louis Stevenson, and Charles Dickens have developed some memorable characters in their various works. All of these have an addiction to opium in common and can be considered as a mirror to the society that these writers were living in.